Season will be kicking off in Feb, so if you are interested in what we get up to, check it out then. This report is well overdue and so not that detailed as most of the… details… have been lost in the jungle mists. However, to recap the situation. In our previous episode the cultists had made off with some vital information from the British Museum, whilst the German agents had captured the professor (again) and made good their escape in the stealth blimp. Alan was last seen heading for the roof of the museum leaving behind the still warm corpses of yet another batch of plucky students. Cut to the jungles of Central America! Andy and I designed this game to be somewhat different. 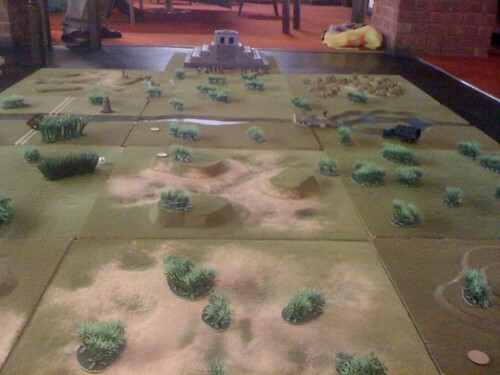 Rather than played out on the tabletop as a standar encounter we used a massive set of tiles on the floor and the aim was for each team to make it to the other side before the others did. The cultists – lead by Sister Dora, Brother Swiper and Brother Boots were rewarded for their game 1 win with a half track able to move quickly through the rough terrain. The Germans, who finished second, got a 6 wheel truck which was slower but still rugged. Alan, joined by some local british explorers, got an old jalopy. In addition each team was allowed to select a number of objects that might help them in this game, and possibly in future games. They were also allowed to draw some cards that either negated some board effects or that they could play on other sides to disrupt their progress. Combat was possible between the sides, but the real challenge was to win the race to the other side. Dotted around the board were some tokens that generated events, clues or treasures. Exploring these could provide useful stuff or cause further problems. About 2 thirds of the way down the board was a river. How to cross it was largely unclear to the teams at the start of the game. So – the teams set off across the board, merrily uncovering nests of scorpians, spiders, and other creepy crawlies, getting bogged down, misdirecting each other and generally making life difficult. Once again Alan excelled in killing off his own side with explorers falling to the local animals or getting shot by disgruntled natives. 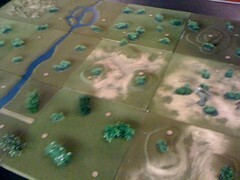 The Cultists made good headway across the table and were able to locate a suitable crossing point. As they had chosen rope and planks for their items they were able to construct a useful bridge and get across. Rather than leave the bridge to the others they unleashed Brother Fuego and his awesome flame thrower to deny the others the crossing. The Germans managed to find a crossing point but whilst heading across Professor Kaffenbach lost his footing and plummeted into the chasm. Ivan and the newly recruited Gil Lopez, German agent in Central America were unable to do anything and so the Germans moved forward into the Jungle. Alan with his ever decreasing band finally made it to the river crossing, but found their way across only reached half way – thanks to a canny card played by the cultist team. However, local expert Penny Johnson was able to charm the local natives and the team finally made it across. The cultists headed for the gap in the mountains and discovered an ancient pyramid, deep in the heart of the jungle. So, to summarise. The cultists got across the river and headed for the pyramid. The Germans followed on quickly afterwards, but lost the Professor to the chasm. Alan, severly depleted again, brings up the rear but seems to have won over the natives with some careful diplomacy on the part of Penny. Let’s face it, Alan is not one for careful diplomacy. What will the cultists find when they reach the pyramid? Is Professor Kaffenbach history or is he destined for an Aragorn style comeback? Can Alan keep the natives on side (track record would suggest… ummm… no) and what might he be able to achieve with their help? What mysteries does the pyramid hold, and what dangers await our teams? Are Hans und Karl looking for a repeat of the hot action with Brother Fuego from series 1? Find out in epsiode 3! Note – Andy put a lot of effort into this game and we hope the players enjoyed the mechanic. It seemed fun on the night and the massive board was certainly unusal and entertaining. Whilst the game lacked actual team on team combat, the terrors of the jungle seemed to be enough and the cards played on other teams kept things lively. I think I was quoted as ‘this could be a great game or bloody awful.’ I hope we hit the former and avoided the latter. Also, kudos to Andy for a great pyramid.